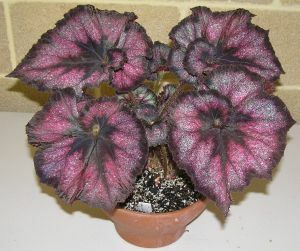 There are a number of types of Begonias and thousands of variations of these types. Some varieties are very difficult to grow and are usually grown only by specialist collectors. 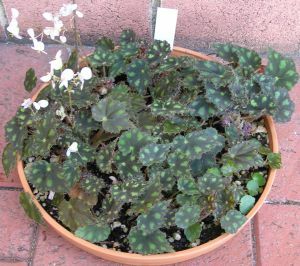 A large number do require extra TLC, but the largest number of Begonias are not difficult to grow when their simple requirements are understood and provided. Click on any header below to display or hide the detail. CANE LIKE: are so called because they have tall, sometimes thick stems with swollen nodes which are well spaced and often resemble a bamboo cane. The plants have distinctive large pendulous clusters of bloom which will hang on the plant for months. Typical canes are Sophie Cecile, Red Rubra, and diadema. Canes should be pruned in spring. Remove all old canes, reduce last year's growth by about half and leave new growths to develop. Most canes will need staking so that the branches can support the large clusters of flowers. Staking is best done when the plant is pruned and repotted, then the new growth can be trained to a good shape as it grows. 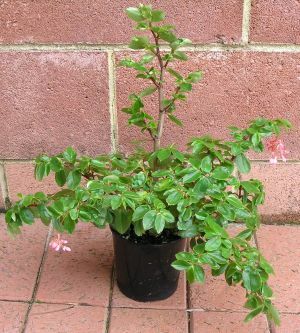 SHRUB LIKE: can cause some confusion because they are not always as distinctive as the other varieties. They are usually small to medium in height, 30 to 60 cm. If they are pruned back and pinched they will bush out and make full compact plants. Most of them produce some basal shoots but not as prolific as semps. Typical shrublike plants are fuschioides, incarnata and domingensis. 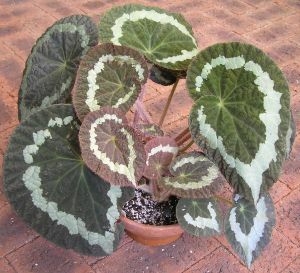 TUBEROUS: are a distinct class of Begonia where the tuber goes completely dormant after each seasons growth. Best in cooler climates they are easily recognisable by the huge double blooms for which they are grown although there are also pendulous and other varieties. RHIZOMATOUS: are plants which form a rhizome. A thickened stem which stores water and nourishment and produces roots from the lower surface and leaves from the upper surface. There are slender rhizomes less than one cm. thick, thick rhizomes 3 to 5 cm, creeping rhizomes and ascendi rhizomes. 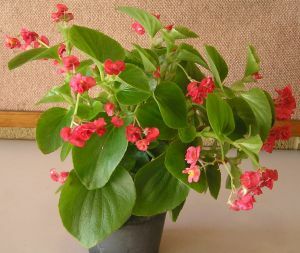 Typical ones are bowerae, Cleopatra and Erythrophylla. Rhizomes are pruned and repotted when they finish blooming usually about November to December. As these varieties are able to store large amounts of moisture in their thickened stems they require less moisture than most other Begonias, especially during the colder months. REX: There is only one Rex species but the plants we grow are generally hybrids. These are classed mainly by their colour and leaf texture. They are naturally rhizomatous but because of hybridising there are exceptions. Since most Rexes are rhizomatous they need the same care with watering. 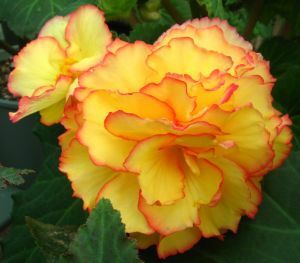 They enjoy a lighter, looser mix than most Begonias and also require more protection, lower light levels and higher humidity. Rex Begonias do not like our cold, wet winters in Western Australia, so do prefer to be kept in a warm day position. These plants will make Ideal terrarium specimens. 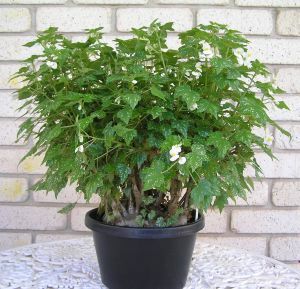 Begonia rex 'Putzey' - the original rex species. 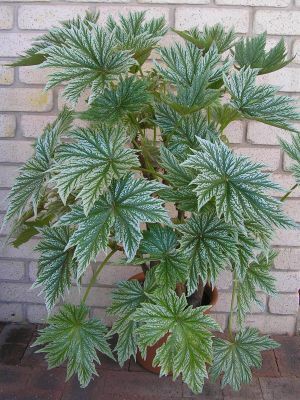 TRAILING/SCANDENTS: any Begonia which has slender stems, and (or) heavy foliage which causes it to trail downwards is classed as trailing. Typical plants are B. procumbens and B. fagifolia. Most of these plants will send up many basal shoots if pruned back and respond well to pinching, so that it is quite easy to produce a full bushy plant. Quite a few of the trailing species are winter bloomers and therefore add winter colour to a collection. As the name suggests these plants can be grown in a hanging container or up a trellis. Some bloom winter to spring and others in summer. The early bloomers should be pruned when they finish flowering November/December. The others are pruned in spring. 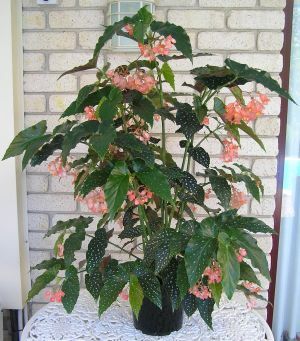 Begonia semperflorens - double pink flowered form. SEMPERFLORENS: are well known and widely grown. The name means ever- flowering and they will if kept dry and warm over the winter months. They can have green, bronze or variegated (Calla type) foliage and either single or double flowers. Always a small bushy plant seldom ever growing more than 30 cm. If cut back to within 3 cm of soil level the plant will produce many basal shoots. Good for mass garden displays. THICK STEMMED: are just that. They produce usually one (sometimes more) thick stem and are loathe to bush out into a compact plant. They usually need staking and most of them require a lot of attention to produce an attractive balanced plant. Typical plants are Pearle de Lorraine, olbia and fernando costae. SEMI TUBEROUS: are easily identified by the thickened base of the stem. Usually the stem forms a tuber at or just under the surface soil but are quite distinct from tuberous in that they do not go completely dormant. Nearly all of the semi tuberous have small leaves. Types are Weltonensis, dregei and partita. They are usually prolific bloomers and when they have been pruned in spring the new growth should be pinched to encourage side growths until the grower is happy with the size and the shape. They can then be left to bloom. 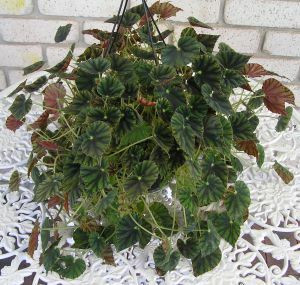 After 2 to 3 months these Begonias can become a bit straggly and then should be pruned back. They will soon regrow and commence blooming again.